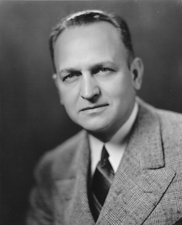 LUCAS, Scott Wike, a Representative and a Senator from Illinois; born on a farm near Chandlerville, Cass County, Ill., February 19, 1892; attended the public schools and graduated from the law department of Illinois Wesleyan University at Bloomington in 1914; admitted to the bar in 1915 and commenced practice at Havana, Ill.; during the First World War served as an enlisted man and later as a lieutenant in the United States Army; States attorney of Mason County 1920-1925; chairman of State Tax Commission 1933-1935; elected as a Democrat to the Seventy-fourth and Seventy-fifth Congresses (January 3, 1935-January 3, 1939); did not seek renomination, having become a candidate for Senator; elected as a Democrat to the United States Senate in 1938 and reelected in 1944 and served from January 3, 1939, to January 3, 1951; unsuccessful candidate for reelection in 1950; Democratic whip 1947-1949; majority leader and Democratic caucus chairman 1949-1951; Democratic Policy Committee chairman 1949-1951; chairman, Committee to Audit and Control the Contingent Expense (Seventy-seventh through Seventy-ninth Congresses); engaged in the practice of law in Springfield, Ill., and Washington, D.C.; died en route to Florida at Rocky Mount, N.C., February 22, 1968; interment in Laurel Hill Cemetery, Havana, Ill. Dictionary of American Biography; American National Biography; Schapsmeier, Edward, and Schapsmeier, Frederick. Scott W. Lucas of Havana, His Rise and Fall as Majority Leader in the United States Senate. Journal of the Illinois State Historical Society 70 (November 1977): 302-20.